I spent a lot of time in my sewing room this weekend! Yay! I finally finished the B4790 Butterick Retro Dress I started LAST SUMMER!! Somehow it is not too bad that I dropped it after I cut the skirt part because I now have a serger which sews garments like a charm. No more raw edges, hems made easy and satisfaction as high as can be! I used a red light weight gingham fabric at Hancock fabrics on sale and the necessary notions such as bias tape and buttons. Like a lot of patterns, this one calls for modifications to fit you perfectly. I personally adjusted the bust part and the shoulder line to my body and followed this tutorial to make the dress look more like the pattern cover. I also decided against the bias tape on the neck opening and just hemmed it which is putting only the accent on the vertical lines. 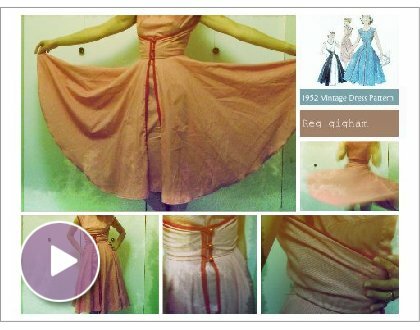 As the fine lady on Edelweiss Patterns Blog mentions, Retro and Vintage patterns are modified to fit the modern figure and loose their original and outdated Retro fitting feel. This is what my version looks like. Unfortunately, not pressed because I had to try it on right away!